Kristen Stewart attended the Chanel fall 2014 haute couture show in Paris on Tuesday morning with a new haircut that looked, well, very familiar. After a moment&apos;s thought we realized that the Chanel face had clearly taken a photo of Winona Ryder in "Reality Bites" to her hair stylist as inspo. We can&apos;t blame her. Everyone wants to be Wino. But what&apos;s more interesting is that she&apos;s not only channeling Ryder&apos;s hair, but her whole look: round-neck tank, filled-out brows and spectator sunglasses. She probably even has an Evian bottle in her purse. So what do you think of Stewart&apos;s Wino homage: hit or miss? Tell us in the comments. 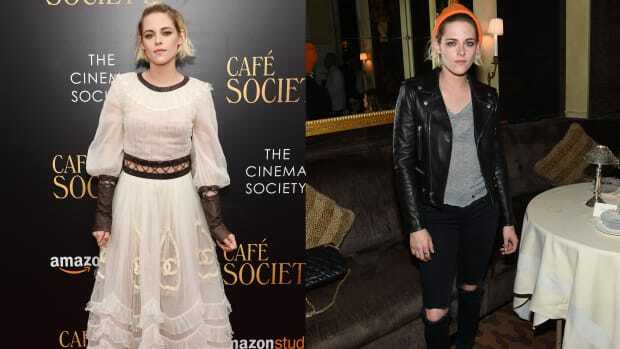 Which of Kristen Stewart's 'Cafe Society' Premiere Looks Do You Prefer? Red carpet Chanel or casual after-party ensemble?